Okay, it’s probably a small thing to quibble about, but does everybody remember the impressive county-by-county election map that the New York Times published after the 2004 election, showing the United States as a sea of Republican red, with a few Democratic blue counties clustered on the coasts and a few urban pockets? Well, today’s New York Times has a large map of the U.S. showing county-by-county election results as a sea of Democratic blue, with red areas limited to a few southern states, Arizona and Alaska. It looks like a Democratic landslide. But Barack Obama did not actually win states like Utah, Montana, Idaho, North and South Dakota, Nebraska, South Carolina, etc., that this map shows as mostly or totally blue. 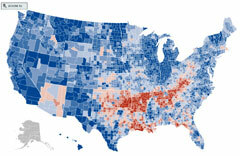 What the New York Times published this year is a map showing the shift in a county’s vote from 2004, not the results. So if a Republican county voted for Bush by 12 points in 2004, but only gave McCain a seven-point advantage this year, the Times paints it as blue, not red. The big blue map consumes the entire top half of the front page of the Times special election section of today’s paper. 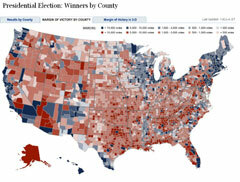 On pages P10 and P11, the Times has several more maps illustrating the election results, including a small county-by-county map that shows that, just like in 2004, most of the land mass of the U.S. is in “red” counties. The Washington Post has a county-by-county results map that looks a lot like the map from 2004, although there is clearly a little more blue this year and the red is a little lighter. There’s no disputing that Obama won on Tuesday, but the big blue map published by New York Times seems like a way to overstate the magnitude of the Democratic victory — maybe just to give liberals a nice blue souvenir to hang on their office cubicles, or maybe a subliminal way of pushing the idea of a huge mandate for liberal government.